Numismatic Guaranty Corporation (NGC) authenticated and graded an additional 427 coins, tokens and medals from the Eric P. Newman Collection. These selections comprise the ninth part in a series of auctions of the legendary collection and will be sold by Heritage Auctions, Nov. 1-3, 2017. The centerpiece of Newman IX is an 1861 Confederate Half Dollar, one of only four struck. It is graded NGC PF 40 and was previously owned by the famous collectors Waldo Newcomer and "Col." E.H.R. Green. In April 1861, three months after Louisiana seceded from the Union, the New Orleans Mint struck the Confederate Half Dollars on the orders of the Confederate Treasury Secretary. The obverse of these coins reused an 1861-O Seated Liberty die while the reverse featured a distinctive Confederate design: a shield surrounded by the words CONFEDERATE STATES OF AMERICA and HALF DOL. The Taylor specimen is now in the collection of the American Numismatic Society, leaving only three examples in private hands. NGC has graded all three, with the ones believed to have been given to Memminger and Riddell both grading NGC PF 40, and the specimen thought to have been given to Davis grading NGC PF 30. 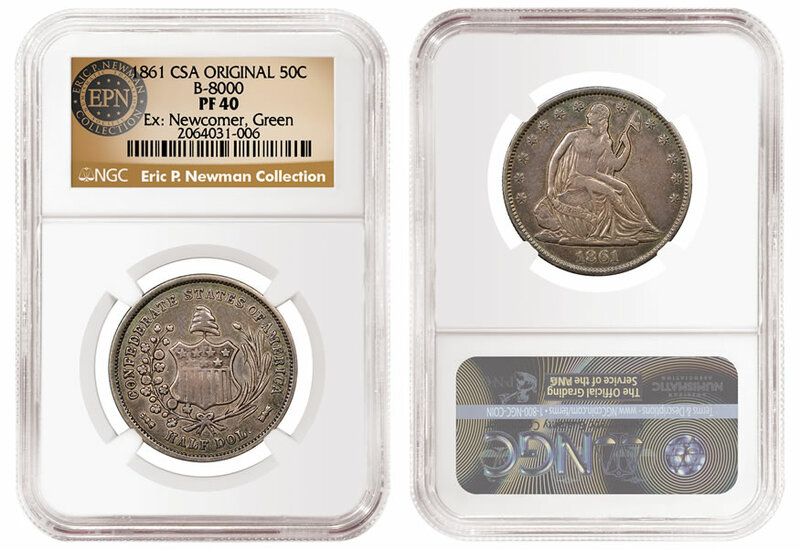 Newman Part IX is the sixth installment of coins from the collection of Eric P. Newman, one of the greatest researchers of US numismatics (the other three auctions relate to paper money). The coin selections, all of which have been certified by NGC, have realized nearly $55 million in the first five sales. The highest price for a Newman coin was achieved by a phenomenal 1796 Draped Bust Quarter graded NGC MS 67 that sold for $1,527,000 in Newman Part II. Amazingly, Newman Part IX contains a second 1796 Draped Bust Quarter, this one graded NGC MS 64 . Another highlight from Newman Part IX is a 1795 Small Eagle $5. Graded NGC MS 64, it is a high-grade example of this rare, one-year type — one of the first gold coins struck by the US Mint. "We are privileged that NGC has been chosen once again to certify selections from one of the greatest collections in the history of numismatics," said NGC Chairman Mark Salzberg. "The breadth of this collection is truly astonishing and reflects Newman’s never-ending pursuit of knowledge." "After the extraordinary success of the selections previously certified by NGC, we were pleased to again choose NGC to certify coins from the Eric P. Newman collection. Bidders trust the accuracy and consistency of NGC’s grading, which has given them the confidence to pay record prices in the past sales." For information about NGC and their grading services, visit www.ngccoin.com. Eric P. Newman is one of the most amazing numismatists in U.S. history. He is from St. Louis & is 106 years old now!